This is the XBee PS2CTH ZigBee module with U.FL antenna interface. It improves on the transmit power and data protocol which allows you to create complex mesh networks based on the XBee ZB ZigBee mesh firmware. These modules allow a very reliable and simple communication between microcontrollers, computers, systems, really anything with a serial port! Point to point and multi-point networks are supported. 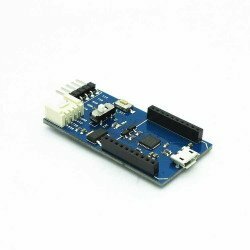 The XBee-PRO S2C module has a uniform pin map with other XBee modules, which means you can plug it on the standard Arduino XBee shield, like DFRobot Gravity IO Expansion Shield. It is very convenient for the user to design their own devices. Description : Foca Pro is a USB to serial UART board with XBee interface socket. It’s the ess..